As the male túngara frog serenades female frogs from a pond, he creates watery ripples that make him easier to target by rivals and predators such as bats, according to researchers from The University of Texas at Austin, the Smithsonian Tropical Research Institute (STRI), Leiden University and Salisbury University. 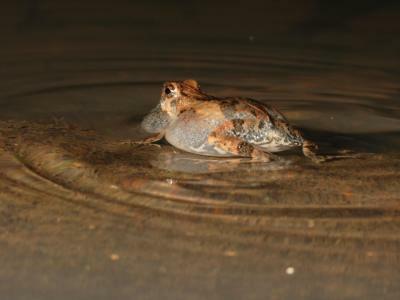 A túngara frog will stop calling if it sees a bat overhead, but ripples continue moving for several seconds after the call ceases. In the study, published this week in the journal Science, researchers found evidence that bats use echolocation — a natural form of sonar — to detect these ripples and home in on a frog. The discovery sheds light on an ongoing evolutionary arms race between frogs and bats. The male túngara frog (Physalaemus pustulosus), native to Central and South America, spends his nights calling from shallow ponds, attempting to attract the attention of a mate. Yet his call, which is based on a pattern of "whines" and "chucks," inadvertently creates a multisensory display that can be exploited by both friend and foe. As the amorous amphibian calls out, his vocal sac continually inflates and deflates, like a pulsing balloon. This pulsating sac creates a visual cue, but also creates a third signal — ripples in the surface of the pond. "A general theme of this research is that the way we communicate with any kind of a signal is by creating a disturbance in the environment," said Mike Ryan, co-author on the study and professor in the Department of Integrative Biology at UT Austin. "When we vocalize, we're causing changes in the air pressure around us and that's what our ears hear. When we use visual signals, light bounces off whatever pigments we're using and is transmitted to the receiver. Anything we do disturbs the environment, whether it's intended as a communication signal or not." Ripples continue for several seconds after a male tungara frog has stopped calling. The researchers found that frog-eating bats (Trachops cirrhosus) were much more likely to attack a target that had both frog calls and ripples radiating from it than one with frog calls and no ripples. This suggests that they can detect these ripples, most likely with echolocation. However, bats appear to lose this advantage if the area around the frog is cluttered with leaf litter, which may stop the ripples from propagating. "The interesting thing is that these frogs have evolved a strategy to escape predation," said lead author Wouter Halfwerk, a postdoctoral researcher at UT Austin who is also affiliated with STRI and Leiden University. "When a frog detects the shadow of a bat overhead, his first defense is to stop calling immediately. Unfortunately for the frog, the water ripples created by his call do not also stop immediately. The ripples continue to emanate out for several seconds, creating a watery bull's-eye on the frog. Bats use the ripples, thereby beating the anti-predator strategy." On the other hand, the ripples seem to enhance the response of rival male frogs to the initial caller. The researchers found that when a call was accompanied by ripples, other male frogs were more likely to respond than if the call was broadcast by itself. In addition, when they did respond, they did so with more gusto. If a call accompanied by water ripples was outside a male's zone of defense, a circle about 15 cm across, rival males would call more than twice as fast as they would if they just heard the initial call by itself. If the call, again with ripples, was inside their territory rival frogs tended to call less, often stopping altogether and deflating their vocal sacs, presumably getting ready to rumble or run.